GoFleet’s offers a control point integration salter/sander monitoring system by Dickey-John as an add-on to their real time vehicle tracking system. The salter/sander monitoring system provides the time, distance and amount of liquid and granular materials that are spread out. 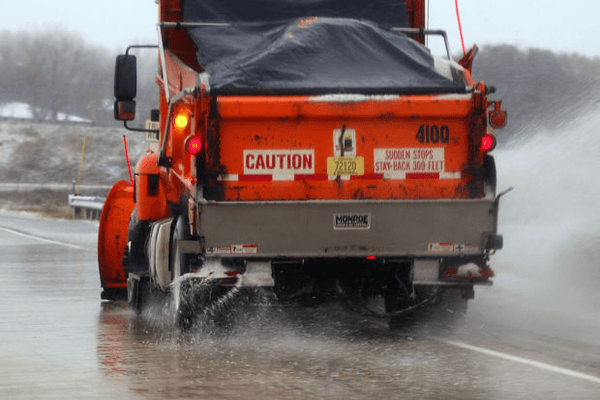 This is an optimal management solution for businesses that provide salt spreading services during the winter months after storm events. When you add-on the salter/sander monitoring system to your real time vehicle tracking system, you will receive more fleet management features for your business. You will now have a map view of the roads or areas that sand, salt or other material was applied. In addition to having an accurate location recorded for the area that was blasted, you will be able to keep track of the quantity and distance of the sand or salt that was used. The real time vehicle tracking system is fully integrated with the Dickey-John sander and salter monitoring system allowing you to have records of the amount of time that is spent applying the material. These features will help you to make your business more efficient. Adding a salter/sander monitoring system on to your real time vehicle tracking system provides many valuable benefits for your business. It allows you to be able to compare application rates to ensure your drivers are not under or over applying the material. Furthermore, you will identify when material is wasted so you can put a stop to the waste and save your business money. There are many management reports available for your convenience or you can create customized reports for your specific business needs. The best part is, the Dickey-John sander/salter monitoring system is fully integrated with your real time vehicle tracking Geotab software so you can access all of the fleet management information and reports in one place.